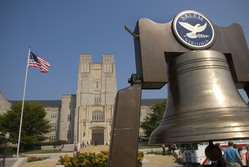 A large bell sits in front of Burruss Hall, ready to be used for the memorial dedication ceremony on August 19, 2007. 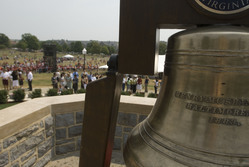 Close-up of a large bell used during the memorial dedication ceremony on August 19, 2007. In the background, attendees visit the memorial as a large crowd disperses.